This entry was posted on June 5, 2013, 00:17 and is filed under Camera Batteries. You can follow any responses to this entry through RSS 2.0. You can leave a response, or trackback from your own site. You have been busy!!! Nice experiment. Good to have the time on your hands to be able to do this. this may be stupid question but I’m fairly new to all this… what is the purpose of those 33 and 47k ohm resistors? They exist so that the Arduino will be able to measure the full voltage from a “7.4” V battery – which I reality is up to around 8.5 V! The Arduino can handle up to 5 V as it is configured – by adding the resistors it can handle up to 8.5 V! Of course this must be taken into account in the calculations! The full voltage from the battery is fed to the “top” of the series connected resistors. They work as a voltage divider presenting the voltage of only 59% (47/(33+47) to the Arduino analogue inputs. If you plan to measure only batteries with voltages below 5 V (in reality!) then you can actually remove these resistors – connect the analogue ports directly to either side of the load resistor and simplify the circuit even more! I have just started to extend the article with a simplified circuit – for batteries below 5 V – as I mentioned to you in my previous reply. Others might be interested in that solution also – so I thank you for the inspiration! One more thing, I noticed in your code that you assume perfect 5V reference voltage for analog readings. Unfortunately, that’s almost never what you actually get on Arduino and it affects measuring precision noticeably. you should use readVcc() function and work with real voltage like this V = analogRead(x) * readVcc() / 1023 instead of using just raw sensor values. Using the built-in voltage reference is very handy, but I use it mostly when I drive the Arduino from more unstable sources than a computer USB. The 1.1 V reference has roughly +- 10% variation (according to the datasheet) which translates to a 4.5 V to 5.5 V swing on the USB port. Without compensation for this possible variation of the reference voltage this did not seem to me to be the easiest/best choice so I settled for the simpler assumption that the USB 5V was “good enough”. Also, I just want to be able to compare batteries with this “PEPs” value and as long as the same computer is used this is very “comparable” between different batteries. You do bring out a weak point in my post and that is that I did no go in much – nothing actually – of the following calculations and that if you want to get correct voltages and mAh capacity you have to do it in Excel or similar. I just mentioned that you should really change “commas” to “tab” to make it easier to paste into Excel – and that only in the code-file! But doing the calculations in Excel and comparing them to my 1% multimeter voltage readings on my two computers shows an error less than 5%. As I mentioned in our last conversation I might do a “small” update – that has actually turned into a much expanded Battery Tester that I will publish shortly. Hope you will like it! And again: Thanks for your suggestion! I will be sure to add a calibration possibility to my new tester! If i want to test a 48V battery type li ion. Do I have to do? The battery is connected to another load like a lamp, Does this would cause a problem in measures? See my ar2uino blog for the answer: Comment here! 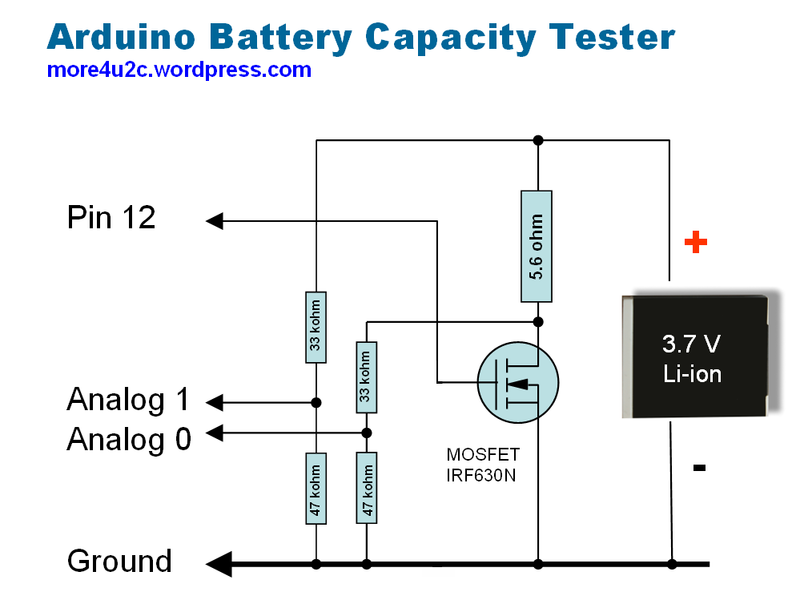 can you tell me clearly about how i can detect resister of battery??? First of all please do have a look at the much more extensive description on my other blog ar2uino.wordpress.com. In that are tables with load resistors for different loads and much more. 1 – Find the internal resistans of the battery? This is a little more advanced but not very difficult. Let me know and I will tell how to do that. 2 – What load resistance to chose for measurement of a battery? On my other blog there are two different tables; one mA table and a Watt table! First use the mA table to find the right load resistor for the battery voltage and mA load you want! (Ex: Say we have a 1.2V NiMh battery with 1500 mAh stated capacity. Normally you would load that with 1/10th of its stated capacity. That would be 150 mA. Go into the table in the column for 1.2 V and go down until you find 154 mA that is the closest you will get with standard resistors. Go out to the left and you will find that you should use a 7.8 ohm resistor. Next you want to use the Watt table to find the Watt generated for the battery voltage and the load resistor you have chosen! In the same 1.2V column look for the value that stands near the 7.8 ohm resistor you picked above. That is 0.2 W in this case. Make sure your load resistor has at least that wattage! If you really wanted to know about internal resistance or have any more questions just let me know!